The social origin of ballroom dance lies in the European court dances of the 17th and 18th centuries. Today, dance is classified as the third most popular leisure and life-style activity after soccer and rugby. No wonder then that North-West University (NWU) is a strong competitor in this popular field. 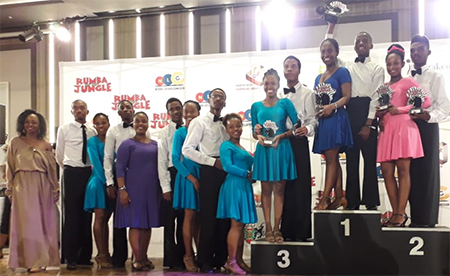 The NWU’s dance club impressed with their ballroom and Latin moves during the Rumba in the Jungle International Festival that took place at the Sun City Hotel from 19 to 21 October 2018. Ten dancers from the campus in Mahikeng made it to the finals, eight to the semifinals and six to the quarter finals. All in all they secured 14 medals and six trophies. Rumba in the Jungle is the biggest dance festival in Africa, staged at the Sun City Resort .It attracts competitors from across the world. Participating African countries include Botswana, Lesotho, Swaziland and Zimbabwe. The festival also attracts international participants from Europe, America and Asia. Perhaps we should follow in these youngsters’ footsteps, as ballroom dancing has the ability to improve cardiovascular and bone health. Moving around also increases your heart rate and can lead to lower blood pressure and cholesterol. The NWU dance team impressed with their Latin and ballroom dance moves during the recent Rumba in the Jungle dance festival.